Carter Center observers Daniel Barnes and Angela Lederach deployed this morning to Cochabamba, a city that has grown immensely in recent years as people have immigrated from rural areas to find employment. 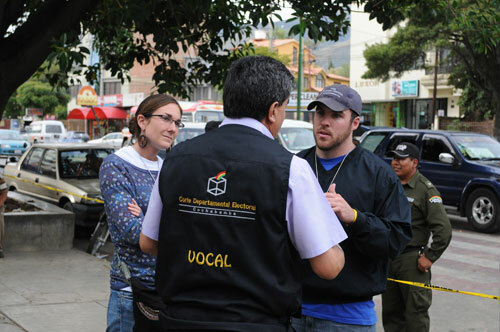 Barnes and Lederach will stay in Cochabamba through Tuesday to observe the functioning of the new biometric voters list and assess the general atmosphere during election day, and then travel to La Paz to debrief with the Carter Center's entire delegation. As a long-term observer for the Center's mission to Bolivia since August, Barnes regularly traveled throughout the region to meet with civil society, political party representatives, the Departmental Electoral Court, and other groups to get an understanding of the key issues. Now joined by Lederach, they are preparing their logistics to observe Sunday's election. Today they met with the Consejo Nacional de Markas y Ayllus de Qullasuyu (National Councils of Traditional Communities of Cochabamba). The organization represents many indigenous groups throughout the region. Attending the meeting was a rare opportunity for the observer team to hear the groups together as they discussed important issues that affect their communities. 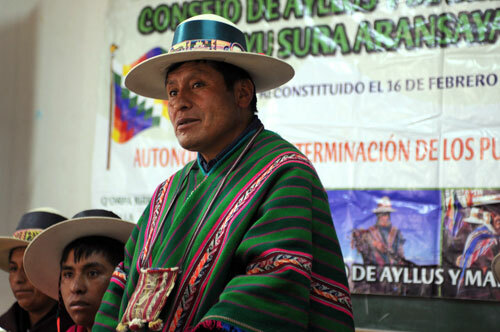 Of great concern to them is the issue of departmental and indigenous autonomy, which will be voted for on Sunday. 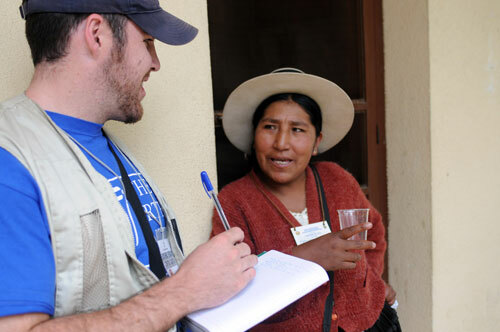 Daniel Barnes talks with Laureana Cunurana, an ex-mama th'allas (traditional women's leader) for an indigenous community of Cochabamba. One of the indigenous leaders addresses the group on Friday. 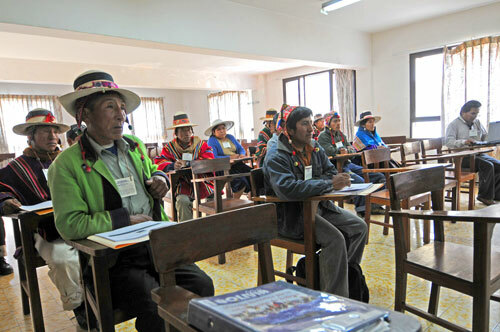 Attendees at the meeting of the Consejo Nacional de Markas y Ayllus de Qullasuyu (National Councils of Traditional Communities of Cochabamba) listen to the concerns raised by their traditional leaders. Presidential candidate Manfred Reyes-Villa enjoys support in Cochabamba, where he was once mayor and prefect, and still lives. 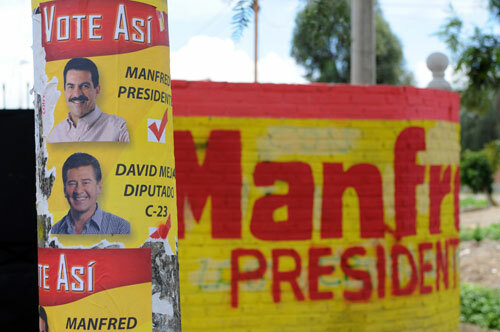 The region is divided politically, with Manfred popular in the city and Evo Morales' MAS party dominating the rural areas. Later in the day, Barnes and Lederach went to the Departmental Electoral Court (CNE) in Cochabamba where they talked with officials about their final preparations and picked up maps of area polling stations to help them plot their route on election day. When planning which polling stations to monitor, observers look for diverse demographic areas and places of potential tension or disputes.